Etsy sller marywibis sells these elegantly spooky cloth napkins,* and though they might seem rather expensive at $50 for 6, given the cost of a basic silkscreening kit (Amazon | DIY) the price is more or less a wash. 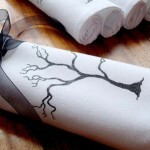 I do like the look of custom napkins, and it might be possible to do simple designs using a stencil and fabric paint rather than silkscreening them. This would make it easier to do several designs in the same set, although given how frequently napkins tend to be laundered I do wonder how long the paint would hold up. *Bonus link: Check out this lovely Black Widow Decanter and matching glasses from the same vendor.